The ones that are most consistently sideways are Alexander's barrel and Diogenes's barrrel. When Marco explained the Diogenes Alexander Sun picture I wondered. 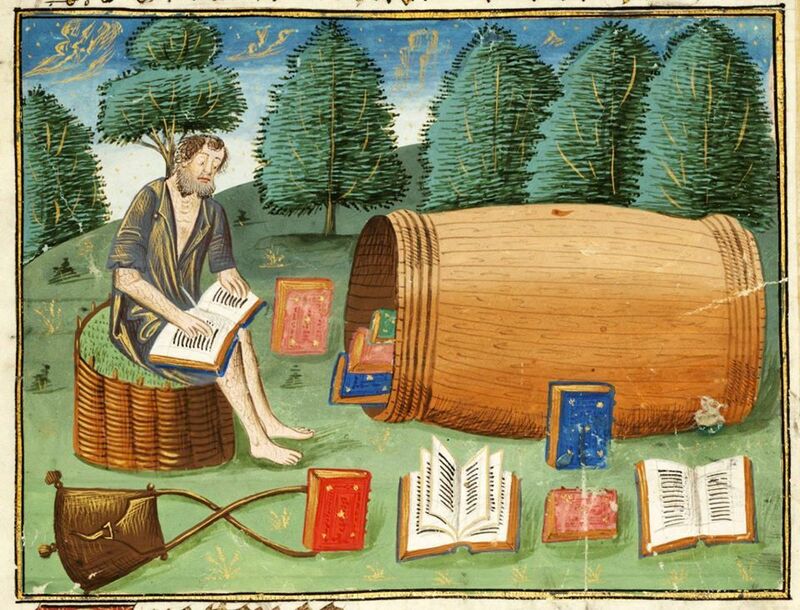 What if the guys in horizontal barrels are metaphorical Diogeneses? Heavenly bodies that are blocked from the sun? Because they go behind the Earth or something. I thought the same thing. 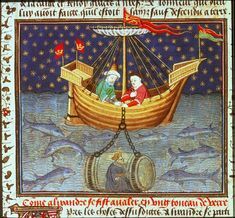 Although... the horizontal barrels are only in Pisces. Another explanation could be the legend of Antenteh and the magical fish. 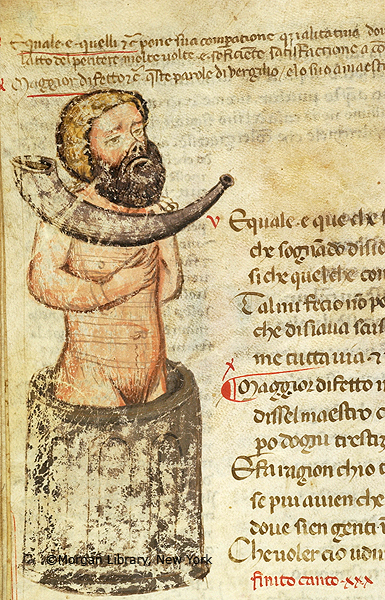 He owned a tub and the story is associated with Pisces. If the figures were telling the story, his wife would be in it, which could explain the mixture of male and female figures. This sort of thing is your special talent, Koen! Antenteh.. first time I hear of that story. I wonder how far it goes back. 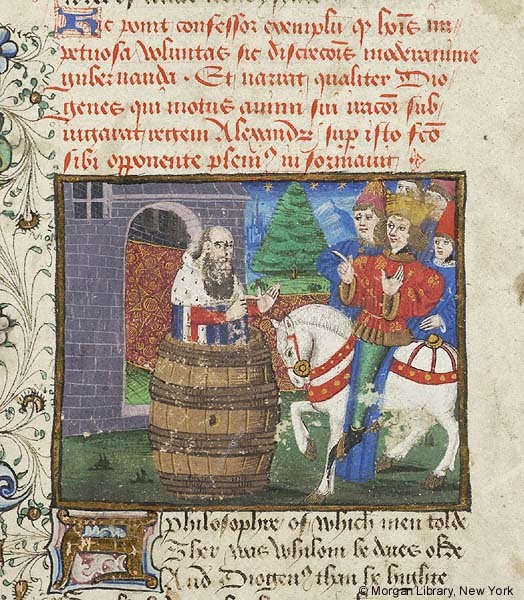 Purely visually what I like about this specific Diogenes image is that he really pops out of the barrel like a snail sticking its head out of the shell. I don't think I've ever seen anything quite as much like the VM figures. His hat (which is worn by other figures in the same MS) is also similar to hats worn by a number of male nymphs in the Zodiac section. Then again, the other thing about Pisces is...Vernal Equinox. that could put the date of the equinox at....March 10-11? I know it was not a Gregorian calendar and there was another thread about this.. Right, something like that does make more sense given the grouping of the figures. I'm on my phone now so can't look up much. But this might be the key to understanding the order of the star nymphs. We must keep in mind that this was likely some nonstandard trick for them to visualise and remember these things. So the meaning is the one they assigned to it. If the figures represent Diogeneses who are happy that those pesky Alexanders are gone, then you've got an equinox around the 20th. In the wiki for You are not allowed to view links. Register or Login to view., there is a paragraph about how the historical accuracy of the whole story is disputed. A. M. Pizzagalli "suggests that the account has its origins in the meeting between Alexander and the You are not allowed to view links. Register or Login to view. in India". Gymnosophist is Greek for "naked philosopher". They were ascetics who wore no clothing, had a sober diet and did not live in houses. The most prominent tale of Alexander has him subjecting ten naked philosophers to a trial of wisdom in order to prevent their execution. I assume Pizzagalli saw a link between both tales of Alexander meeting ascetic philosophers. 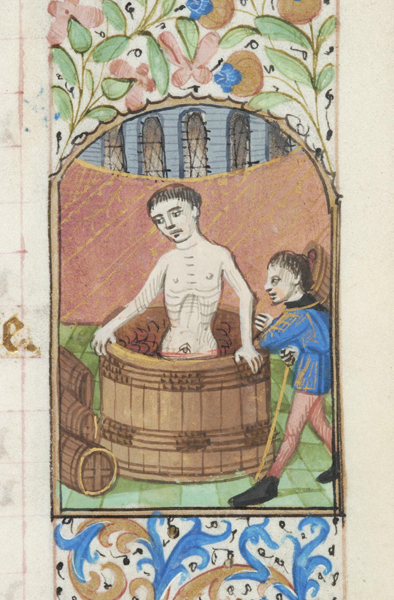 If there was some in between form, this may contain ten naked people in barrels. It might be worth it to hunt down the reference: A. M. Pizzagalli (1942–1943). "Influssi buddhistica nella leggenda di Alessandro". Rendiconti dell'Istituto Lombardo. 76: 154&ndash, 160. Man that gymnosophist in the crown is well endowed. And what's that one on the right doing chasing that rather concerned looking lady? The "sober diet" didn't do much to endow a sober spirit! Those Greeks certainly knew how to enjoy themselves. Quote: Thereupon many statesmen and philosophers came to Alexander with their congratulations, and he expected that Diogenes of Sinope also, who was tarrying in Corinth, would do likewise. But since that philosopher took not the slightest notice of Alexander, and continued to enjoy his leisure in the suburb Craneion, Alexander went in person to see him; and he found him lying in the sun. Diogenes raised himself up a little when he saw so many people coming towards him, and fixed his eyes upon Alexander. And when that monarch addressed him with greetings, and asked if he wanted anything, "Yes," said Diogenes, "stand a little out of my sun. "You are not allowed to view links. Register or Login to view. It is said that Alexander was so struck by this, and admired so much the haughtiness and grandeur of the man who had nothing but scorn for him, that he said to his followers, who were laughing and jesting about the philosopher as they went away, "But truly, if I were not Alexander, I would be Diogenes. "You are not allowed to view links. Register or Login to view. Obviously one would expect the mighty King to slay such an insubordinate mortal at once, so the story is rather more about Alexander's wisdom than Diogenes. A fascinating bit of propaganda. So far I haven't been able to access Pizzagalli's work. In the literature, the "naked philosophers" and Diogenes the Cynic are often mentioned together because they are the same category of story, one which was liked by the cynics: a philosopher or sage outwits a king, thereby affirming superiority of philosophy to the laws of the land. It is thus understandable that the Cynics liked both tales, and indeed saw them as utterances of the same thought. " It is also mentioned by the sources that there were women living among the Gymnosophists, and multiple women are featured in Medieval illustrations of the tale of the Ten. There is of course also a link with the Alexander Romance, which we've seen before for Anchiton reasons. On the other hand the tales are quite different and I just don't see how we'd get to ten naked Philosophers in Diogenes barrels. Unless there is some evidence for a merging of both myths this may be a dead end. 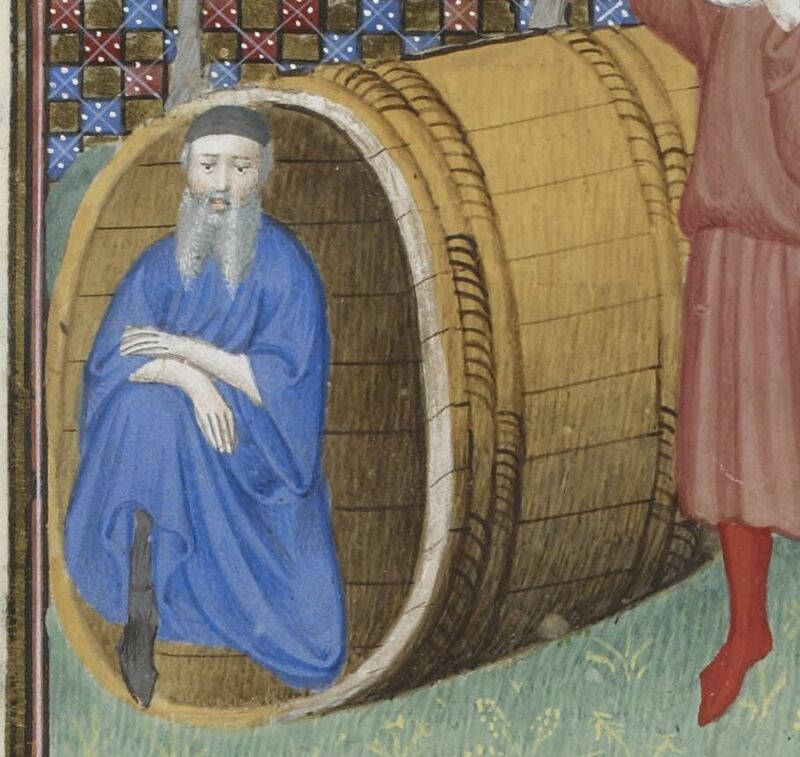 One more man in a barrell.